Amongst other things, 2016 marks the 350th anniversary of the Great Fire of London. The fire started on 2 September 1666 at the bakery of Thomas Farynor in Pudding Lane and raged for three days, to be finally put out as it reach the Temple. In charge of the fire-fighting operations was James, Duke of York. 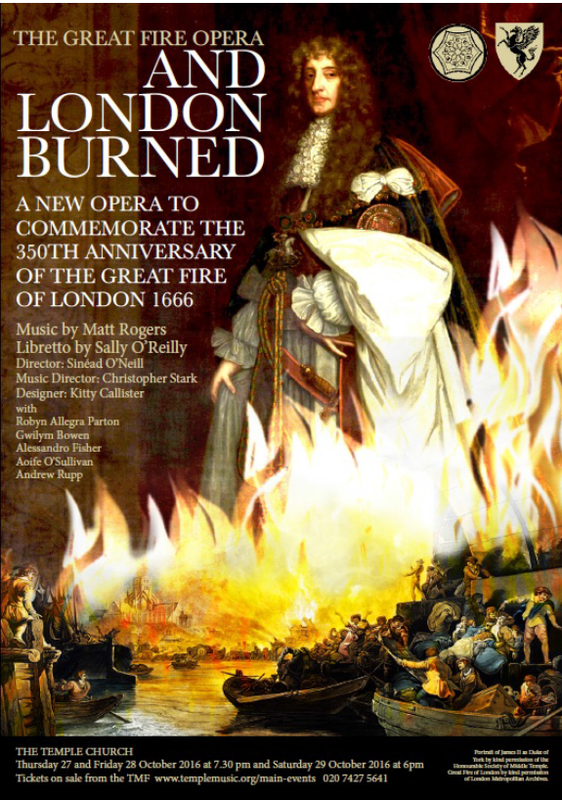 To celebrate these events the Temple Music Foundation has commissioned a new opera And London Burned, to be premiered at Temple Church on 27, 28 and 29 October 2016. And London Burned is written by composer Matt Rogers and librettist Sally O'Reilly, and their work has included The Virtues of Things which premiered last year at Covent Garden's Linbury Studio. And London Burned will be directed by Sinead O'Neill, who is a staff director at Glyndebourne, and the conductor is Christopher Stark, founder of Multi-Storey. The cast includes Gwilym Bowen, Alessandro Fisher, Aoife O'Sullivan, Robyn Allegra Parton, and Andrew Rupp. Further information from the Temple Music website.